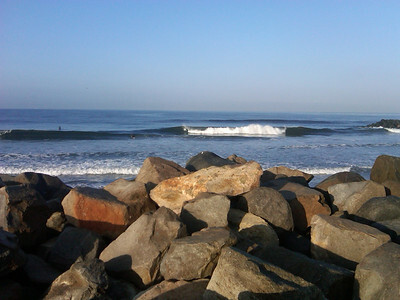 Fall has arrived in San Diego and thank goodness it is bringing some gorgeous summer weather with it! This year our annual May Gray turned into the usual June Gloom which extended into the July... bly? And on into August and even September. What a "summer" it has been, cold, dreary, drizzly and not a whole lot of sun. However... we finally woke up to a bright sun peeking over the horizon and received a whole new look on life. The world bathed in the morning sun is truly beautiful. Light, low on the horizon, provides a photographer's dream with soft, golden colors, and beautiful angles. And to imagine I found myself on my morning beach walk without my camera! Luckily my husband has supplied me with a trusty blackberry and with how nice this image turned out I'm wondering why the heck I need all my Canon equipment?? (To my husband - if you are reading this I'm just teasing!). Sunny weather, warmer temps and a touch of summer automatically send me to the grill. With a perfect pork tenderloin in the fridge, a few spices in the pantry and a bowl full of market fresh heirloom tomatoes, the Rubbed Tenderloin with Black Bean Salsa was a given. The spices are those one usually has on hand and are easy to whisk together at a moments notice. The salsa also uses fresh ingredients that are not out of the ordinary, but when mixed together provide a lovely contrast to the slightly spicy, tender pork. Finished off with a side salad, a slice of focaccia and a bowl of fruit we have a meal that works for the whole family! 1 pork tenderloin, removed from wrapping and rinsed with water, pat with paper towel. Preheat gas grill on high. In a small bowl mix together the rub ingredients and whisk to blend. Spray tenderloin lightly with cooking spray and rub with a squeeze of lime if desired. Rub again with desired amount of rub. Place directly on grill and lower heat to medium low. Grill, turning occasionally, until a meat thermometer reads 140º (official guidelines recommend cooking pork until 160º, however, I prefer my meat not to be well done!). Remove from grill and let rest for about 10 minutes. While meat is cooking, prepare the salsa. Mix the salsa ingredients together, adjusting amounts as desired. Taste, adjust salt if necessary. Cut the pork into slices and top with salsa, serve with a lime wedge. Note: This recipe provides pork for about 3 people, recipe is easily doubled! The salsa will serve the 4-5 easily and will have leftovers. Mmmm! Looks very good. 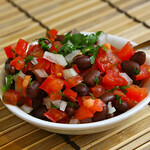 I love the freshness of the tomatoes and black beans. The rub sounds great. I like the burnt spot! It's smokey and crispy. The black bean salsa seems to go well wit it! Looks wonderful, Kim. We have a big pork tenderloin in the freezer and I could use a good recipe for it. Glad you are having some nicer weather! You really took that pic with a blackberry! Why do you keep making my favorite foods. That pork looks so good! 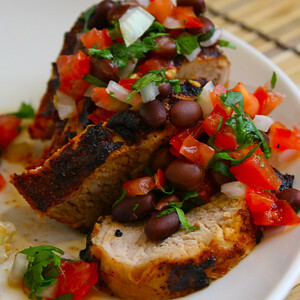 the pork looks so good !and the black bean salsa also! Oh wow I could totally see eating this pork and salsa until I've had my fill. If that's the view from your morning walk I am jealous of that too. And from your blackberry?? NICE! This looks so delicious. I have to try this out. I have not had a black bean salsa before with pork. I think the cobination is wonderful and must bring the flavours out!YUM! What a refreshing dish. That salsa is just beautiful. I think that I need to get a Blackberry and toss my camera. 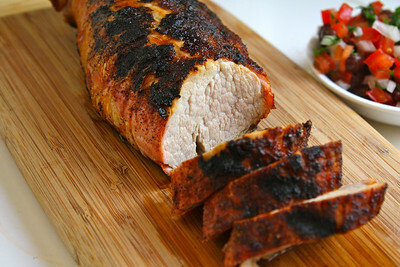 Your pics and pork tenderloin look great! Looks Yummy! What a colorful dish! The tenderloin by itself looked fantastic and then you added the picture with the salsa and it was phenomenal. Very appetizing pictures and dish. Will, actually, no, the pork was not dry at all! I usually cook pork to about 140º on the grill then let it rest for a few minutes. This will give you a slight pink in the center(nope... that didn't show well in the shot). I find that if I cook it to a higher temp it will indeed by dry.